Conducting a Monthly Social Media Campaign on Four Major Platforms illustrates how you can create a successful social media campaign to build awareness, get more clients or customers, and increase your sales through posts on four popular platforms. You can use this approach both to appeal to prospects in your own area or nationally, and even internationally, depending on the target market for your business. The basic model is based on sending out a short pitch and a photo each day to four different social media platforms - Facebook, Twitter, Instagram, and LinkedIn - for a month. Then, you can extend the pitch and photo for another month or more or change the platforms and when you post. Very informative and shaped around the modern age. As a millennial I thought I knew most of the stuff there is to know about social media and how it works but this book completely changed my mind. The processes and amount of work that goes into social media advertising and campaigns is surprising. The complex detail that this book goes into about posting copies on social media is very informative. One thing specifically that I found interesting was the use of hashtags. These companies use specific hashtags to target certain areas and also limit the amount of hash tags they use to avoid overwhelming their listeners. Another positive of using hashtags is that your social media post form one website can be post to other sites if you use the right hashtags. Another thing discussed is the use of ghost writers. Big name people like Donald Trump and Hillary Clinton didn't actually write their books but hired people to do it for them. 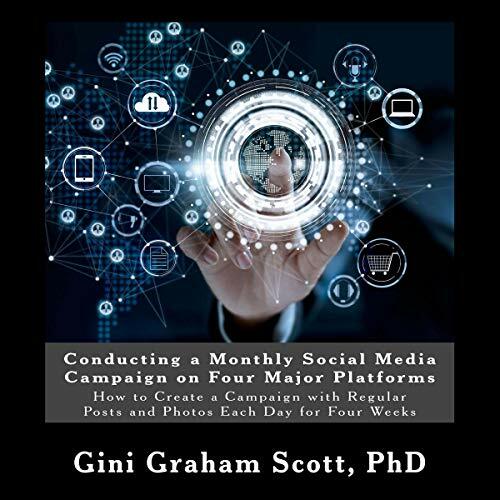 This book gives you a step by step guide to each week of your campaign and how to post. The importance of using pictures to capture peoples attention is also very informative. All of the points that I discussed are covered in way more depth in the book and will give you a step by step process to them. I recommend anyone to give this a listen it will surprise you.